Stop Dreaming - Start Swimming! Let our team build your dream pool - deck included! Our customers are always amazed when they see what a difference our work can make. There’s really nothing to compare to a custom-designed pool deck made from pavers that you’ve picked out yourself, shaped and colored to your exact specifications. Over the years you’ll be even more pleased with your choice, as you discover the excellent durability and safety that deck pavers provide. There’s no “one size fits all” attitude with us. Instead, we take inspiration from your home and your surroundings. Our team will closely consult with you to find exactly which design option is the perfect one for you, down to the last detail. Does your home need the subtle understatement of modern charcoal and slate bricks? Or perhaps a more classic look, with elegant Victorian-style pavers. Whatever you want, we can provide it. We guarantee your pool deck will look exactly like you imagine. Make no mistake, great design is an investment. A carefully designed and well thought-out pool deck will make your home stand out from the rest, and often adds a significant amount to your property’s value. Whether you want to maximize your home’s value and curb appeal, or pass it on to the next generation, deck pavers are an investment that pays dividends. Our pavers are designed to provide a non-slip surface even when wet, which is crucial when it comes to poolside decks. You won’t find puddles building up, either, because our pavers can quickly drain away excess water into the earth, leaving you with a beautiful and safe deck no matter what the weather’s like. Pavers are incredibly durable, and can stand up to heavy traffic, chlorine, and extreme temperatures without any problem. However, you may find that a few of them can suffer damage over the years or lose their attractive hue. This is no cause for concern, though, because it’s easy to replace them. This means your deck will continue looking its best for years to come. 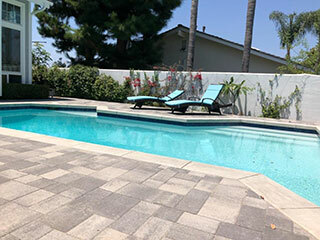 Our experts at S&P Hardscape Remodeling Los Angeles are ready to help you design the perfect looking pool deck. We're happy to answer any question, so don’t hesitate to reach out to us to find out what we can do for you.